A relaxing soak in a hot tub is a time-honored stress reliever but the advantages are not confined to humans -- with monkeys also benefiting from spa time, researchers in Japan say. 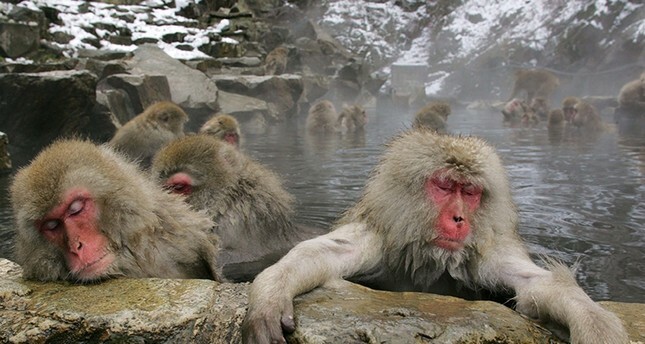 Japan's "snow monkeys" are known for their love of hot springs in the country's northern Nagano region, with tourists flocking to photograph the mediating macaques soaking in steaming baths. It was long assumed that the blissed-out bathers were simply trying to warm up during the chilly winter months, when snow blankets the region. But experts at the Primate Research Institute at Kyoto University who observed 12 female Japanese macaques in 2014 at the Jigokudani Yaen-Koen monkey park in Nagano found there was more to it. They examined the bathing behavior of the monkeys and collected their excrement to measure glucocorticoid, a hormone whose concentration increases when stress levels are high. They found that stress levels in the monkeys, aged between five and 24, were about 20 percent lower on average after bathing. The results of their study were published this week. "The study showed that bathing in hot springs is beneficial not only for people but for Japanese macaques too," researcher Rafaela Sayuri Takeshita told AFP. Takeshita believes the spa treatment may have additional benefits for the macaques, perhaps increasing both fertility and longevity. "We also want to study the relationship between bathing and their reproduction and longevity in the future," she said.